Stroke survivor give his first thumbs up! ….and owes a part of his success to Mirror Box therapy! 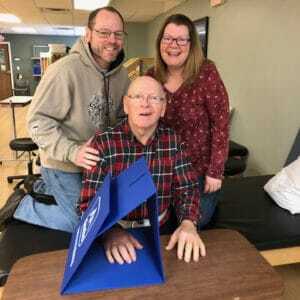 Coy’s life before his stroke on December 2, 2018, was fun and fulfilling. He gathered regularly with friends and family, was a talented fast-talking auctioneer, traveled all over to tractor shows, and raised family of goats on a small farm. Like many other stroke survivors, Coy’s stroke caused his right dominant arm and hand to be almost entirely paralyzed. He also struggled to pay attention to his affected side—a very common yet disabling condition that can be a safety concern and interferes with regaining use of the weaker side. Every stroke is different, and every patient’s stroke recovery experience is, too. Just as your symptoms depend on the severity of the stroke and treatment you received, your ability to regain certain functions and work toward recovery will also depend on a variety of different physical factors. However, it helps to know a little more about what to expect in the days and weeks ahead. You’ve learned about the different stages of stroke recovery, but in order to simplify this experience and improve recovery odds, it’s important to understand more about each stage. If a patient or loved one has recently experienced a stroke and lost motor control on one side of their body, they’re probably in Stage 1 of their recovery process. But what exactly does “Stage 1” mean, and how can patients and their caregivers navigate this first chapter of the journey toward recovery? Let’s start by breaking down the nature of this first stage. After you understand the basics of your Stage 1 progress, start applying some of the most helpful recovery techniques to reach the second stage.